Madigan made… a project for Mod Podge Rocks! You know what they say, “April showers bring May flowers.” One of my favorite things about the springtime is all of the flowers… ESPECIALLY the tulips! Are you in need of a pretty way to display your favorite spring blooms inside? Or maybe you need an idea for a handmade gift for Mom this Mother’s Day? 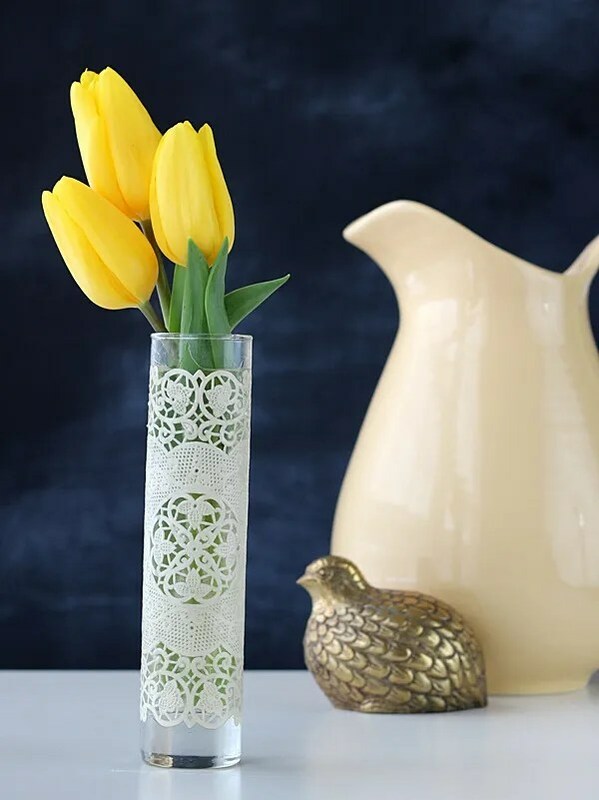 Well, grab a plain vase, a pretty paper doily and some decoupage and join me over on Amy’s blog this week to find out how to make this simple lace covered vase for the spring! P.S. In other fun news, I’m in Utah this week to attend the SNAP! conference for creative bloggers. I went last year and enjoyed it so much. If you wanted a sneak peek, follow along with me on Twitter or Instagram as this pregnant chick (in a lot of stripes, since that is all I seemed to pack!) learns more about blogging, meets other fun DIY/craft bloggers, and maybe attends a pajama or 80’s themed party or two!